HP Proliant DL 180 G6 motherboard 608865-001 PCIe x16 Question. 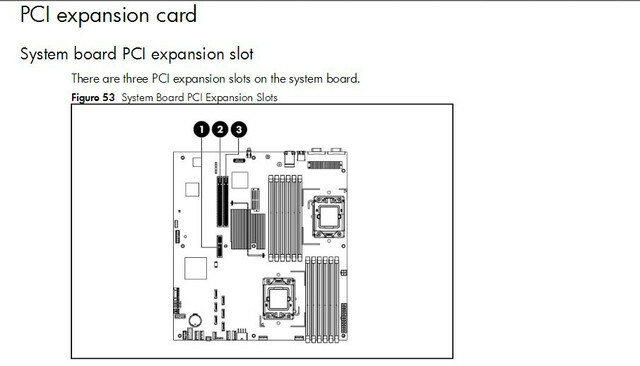 Does anyone know how many lanes the PCIe x16 slot is connected to the HP DL 180 G6 motherboard (608865-001)? What is the PCIe x16 version on this motherboard? Re: HP Proliant DL 180 G6 motherboard 608865-001 PCIe x16 Question. According to quickspec slot 1 is 16x, other slots are 8x. As far as I know, this mainboard has only 3 slots!? Depends on the riser used.